Big Piva has landed at Power Reserve. Piva Wright, the former Richmond rookie and Dandenong Stingray has put pen to paper at the Doveton Eagles in Southern Football League Division 2, and it’s sure to keep plenty of defenders up at night throughout 2019. More recently, Wright, 25, plied his trade with Noble Park in the powerful Eastern Football League, topping the goal kicking for the Bulls with 38 majors in a terrific season in Division 1 for the power forward. 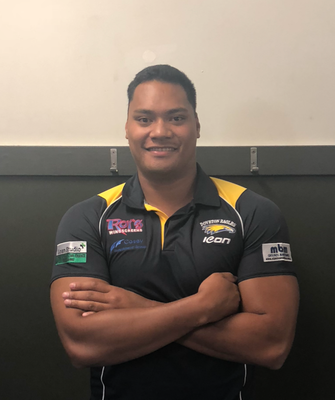 Doveton Eagles president Shane McGrath said that the club was thrilled to welcome in someone with a quality character, and expects the high profile recruit to settle in well. “We’re thrilled, he’s a local guy who works at the local primary school, so it’s been a really community focus for us – he ticks a lot of boxes, that’s for sure,” he said. Despite Noble Park desperate to hold on to the power forward, McGrath said that Wright was keen to play with some mates. “It all happened really quickly – he’s got some friends around the club, so that always helps when you get to play with mates,” he said. The Eagles have managed to lure big names such as Nick Battle, Ryan Hendy, Darren Sheen and Russell Robertson to the club, and McGrath said it points to the culture and brand of footy that’s been established at the club. The club is desperate to work its way up to Division 1, and won’t take a backwards step. But, after losing Sheen to Kooweerup after a brief stint at the club, the search was on for another power forward with the capability to kick big bags of goals. “We’ve worked really hard to be attractive to players wanting to come in, and that’s (signing Wright) justification, i guess,” he said. The Eagles – who were runners-up in Div 2 this season – have also announced Scott Irvine, a wingman who has played with Kilsyth and Seville, highly rated tall forward Jye Siegersma, who also comes across from Kilsyth, as well as dynamic half-back Andrew Ray from Narre Warren, and will be gearing up for yet another assault at a premiership. “We’ve added some other quality players, and we’re all about bringing in quality people too,” he said. “Andy Ray has Southern experience and dominated div 1 a few years ago, and Jye and Scott are great footballers who have put work and personal life before footy the last few years, and they are now more settle personally, so are looking to change their focus to footy a bit more. The Eagles are also keen to start an Under 19s side for 2019. If anyone is interested, contact Shane McGrath on 0466 459 360.